Jazz Carlin posted the first Welsh medal of the 2010 Commonwealth Games with silver in the women's 200m freestyle swimming event in Delhi. Carlin, 20, finished behind Australia's Kylie Palmer, with England's Rebecca Adlington taking the bronze. England's Michael Rock also won silver, in the men's 200m butterfly, as did the English men's 4x100m freestyle team. 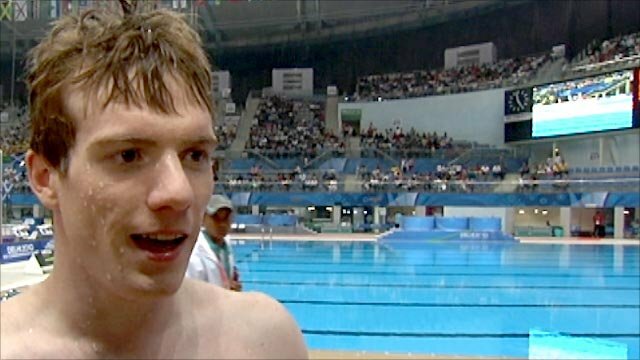 Scotland's David Carry swam to bronze in the men's 400m freestyle, narrowly won by Ryan Cochrane of Canada. Fellow Scot Hannah Miley struggled to fifth in her 200m individual medley final - where Australian Alicia Coutts surprised team-mate Emily Seebohm, beating her to gold. But Palmer became the first Australian onto the Delhi pool's podium, surging through on the final leg of the 200m freestyle final to win gold in a time of one minute 57.50 seconds, ahead of Carlin (1:58.29) and Adlington (1:58.47). "I'm really chuffed," said Carlin. "It's been so long since a Welsh woman won medals, it's such an honour. "The amount of time between the races has been difficult. I did not get much time back at the village but as soon as I had swum down and got some food in me I was ready for tonight. "My Mum and Dad will be watching at home and my Mum will be crying her eyes out on the sofa." Adlington said: "I'm very pleased with that swim, the 200m for me is a bonus event, and it's nice to get involved." The 21-year-old is the Olympic champion over both the 400m and 800m distances, and is experimenting with adding the 200m to her repertoire in Delhi. "It's definitely a tough week but now's the time to try it, try to cope with it and see how you do," she told BBC Sport. "If I don't cope with it and tire towards the end of the week, I have the chance to say it didn't work for me. Better to try it now than at the Worlds or Olympics." Carlin becomes the first Welsh woman to win a Commonwealth Games medal since the 1974 Games, where Patricia Beavan won gold in the 200m breaststroke. Yorkshire's Jo Jackson - who has endured a traumatic time since winning three medals at the 2009 World Championships in Rome, with illness and severe asthma restricting her training and competition - finished fifth, while defending champion Caitlin McClatchey of Scotland failed to reach the final. Rock and Joe Roebuck led the men's 200m butterfly as an English one-two at one point, but Roebuck faded fast while Rock found himself beaten at the line by South Africa's Chad Le Clos, who won gold in a Commonwealth Games record of 1:56.48, ahead of Rock's 1:57.15. "I've had a great year, finishing my degree and now producing a great performance at a major meet to win my first medal," said Rock, who took silver from lane eight. Carry, the defending 400m freestyle champion, was never in the running for gold or silver as Canada's Cochrane scraped ahead of Australia's Ryan Napoleon by 11 hundredths of a second, in a time of 3:47.48. "I wasn't going to give it away without a fight, I really went out there in the first half of the race," said Carry, who finished in 3:50.06. "It's a medal, I'm delighted to do it, and seeing the Saltire flags all over the place is great. It's great to be back on that podium." Wales' David Davies, who won bronze four years ago in Melbourne, broke his season's best by two seconds to qualify but could only finish fourth, while Scotland's Robbie Renwick came sixth and England's Richard Charlesworth eighth. Miley had been the fastest of the home nations' swimmers through to the 200m individual medley final, but she looked well off the pace from an early stage of the race as Coutts and Seebohm battled for victory. Seebohm, 18, had been expected to challenge for eight Commonwealth gold medals, but 23-year-old Coutts put paid to that ambition on the opening day of the Games. Coutts won in 2:09.70 with Seebohm taking silver in 2:10.83, well ahead of fifth-placed Miley's 2:12.90, while English pair Aimee Wilmott and Kate Hutchinson finished sixth and eighth respectively. "I need practice on getting up and getting out there on the first day," said Miley. "I've made it a little harder for myself because the 400m individual medley is my main event, so this is a splash-and-dash. I was pleased with the swim but disappointed with the time." The swimmers in Monday's last event, the men's 4x100m freestyle relay, endured a lengthy delay as officials attempt to fish some debris out of the English team's lane. But, once under way, the English put those troubles behind them and raced to silver, threatening to end Australia's dominance in the pool at times. However, Australia - anchored by James Magnussen - came back over the last 50m stretch to take gold in 3:13.92, ahead of England's 3:15.05. Scotland were fifth, with hosts India sixth and Northern Ireland seventh. Elsewhere, England's world champion and world record holder Liam Tancock reached Tuesday's final of the 50m backstroke alongside Wales' Marco Loughran. 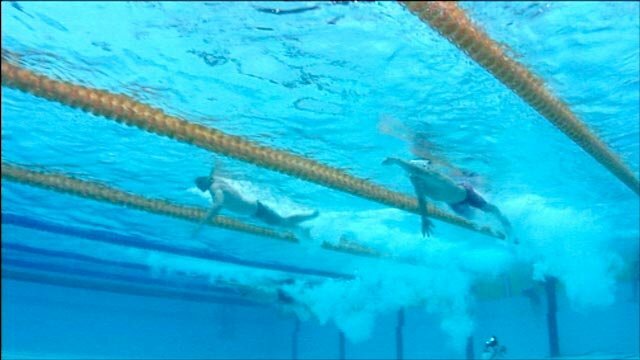 Fran Halsall came through her 50m butterfly semi-final, finishing just behind Australian star Emily Seebohm, while Halsall's England team-mate Ellen Gandy had to face a swim-off for a final place when she finished tied for eighth after the semis. Halsall, whose main events are freestyle, said: "It's just a bit of fun really. It's another one to add in to the programme that doesn't clash so I thought why not give it a go? "I'm in the mix so I'm pretty happy. I just need to keep working on my start for tomorrow." England's teenage breaststroke prodigy, Achieng Ajulu-Bushell, finished second-fastest behind Australia's Leisel Jones in the first 50m breaststroke semi-final. Kate Haywood will also represent England in the final, with Scotland's Kathryn Johnstone also making it through.